There are only a few really iconic creatures over the years that have spawned multiple movies based around how cool they are, with Predator, Alien, and Terminator the only ones that come to mind. There are of course the Nightmare On Elm Street, Halloween, and Friday The 13th films, but those are all based on one bad guy that keeps coming back, where as the ones I’m talking about can never die, as they are a species or a mass produced product. Being a kid of the 80’s as well, meant I grew up on a nice dose of all three of these creatures, even if the first in each series either came out before I was born, or way before I should have been able to see them. But don’t you worry, as I remember all too well seeing all three well and truly before the appropriate age I was meant to. Because of this, they never warped my mind or gave me nightmares, but instead it gave me a deep love of these cinematic monstrosities. I would have to say I rank my favourite of the three creatures with Predator at the top, followed by Alien, and then the Terminator. Though that doesn’t mean I like the franchises any less or more than the other, as let’s be honest, they have all had their highs and lows with the various films, and it’s hard to pick which series really stands up to the measuring tape of what’s better than the rest. All I know is, that when a new film in any of the series comes out, I’m pretty keen to check it out. 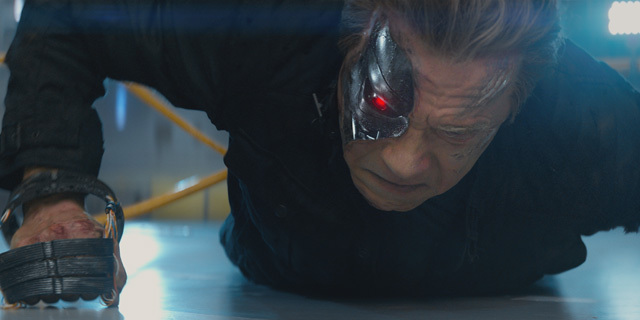 So with Terminator Genisys at the cinemas, which is the 5th outing for the franchise, I was excited to see what would happen next, though I also have to admit the trailer didn’t exactly blow me away. And well, neither did the film. I’ll keep this short, as I’ve rambled enough as it is, but I’ll say this, there was lot’s I really liked, and a decent amount that either didn’t make sense or just seemed a little off, but all up it was a fun ride, and may sit 3rd or 4th on the franchise list when ranking favourite to least favourite, though maybe another watch is in order.